580 is GOOD with Ryzen. If you look at the graphs on the net, AMD GPUs get a little more performance with Ryzen CPU. Nvidia is better with Intel CPU due to some optimizations. It is noticeable in ARMA as there is more cpu and gpu usage, where AMD GPU gets LESS usage with Intel CPU. So 580 8GB is a top card for ARMA at 1080p. I wish I could have bought one but it is completely sold out here when I was shopping and ended up with 1060 3GB to save money. single core performance matters. 3 more cores help a liiiitle bit. 2 extra cores and 8 exra threads are 0 performance impact for arma. so if you dont have a lot of money, but your main goal is good arma fps, then go with a z390 or z370 board with an 8350k, and learn to overclock. its about the same price as a ryzen cpu, but a good amount of more fps. and you can upgrade later. what matters mostly is clock speed (and effectiveness), ring speed (north bridge seems to have a greater performance impact in arma, then in many other games), ram speed, disc speed. 20+ cores and threads do nothing for you. or wait for ryzen 3 in about half a year. maybe they will get competitive in SC performance too. If you are on a budget and looking for an "out of the box" solution here and now, the best option is probably a Ryzen 5 2600/B 450/8GB DDR4 3000 combo. WD5000AAKX Blue 500GB (8,9 cm (3,5 Zoll), 7200rpm, SATA 6 Gb/s, 16MB Cache) <- is this slow ? when in AO zone in KOTH for example stuttering exaggerate. Hi Ball Race, welcome in our Armaverse common house. * Most of the time, stuttering in Single player is related to HD.Arma3 is streaming textures and a high speed disk is needed. That's why since APEX release, "Recommended" official specs have been updated. Now, a "SSD / Hybrid HDD / SSHD storage" is needed. * I must add that Arma is very sensitive to memory usage. When you play Arma, you must close all other application and programs, browser and "social" thing are forbidden. The only items allowed are a comm. tool, Teamspeak, Discord ... and if needed a monitoring tool such as FRAPS or Afterburner. Virtual memory must be allowed. In MP, it's a bit more complex, for, the quality of the server and the quality of your connection effects are added. - Ethernet cable is the best option, playing in WiFi is only possible if you have a strong signal and do not share the connection. - Try to play only on well managed servers with a ping under 80ms. 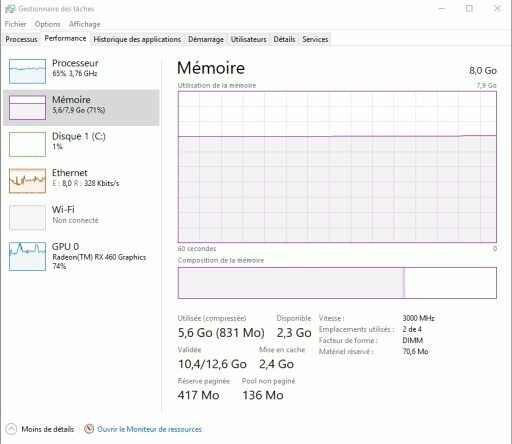 When it says RAM of 6 GB, does that mean you need 6 GB in total in your pc or that only ARMA 3 needs 6 GB, so the ram in your pc should be 6x2 for example? Even with a SSD i can't have chrome open? I am on Ethernet cable. This is my hardware when ARMA 3 runs with multiplayer. Ok. Which SSD should I choose? I wanna spend like 50 Euro on the SSD and it should be ready for my next board in few years. What you want is DDR4 3000+ of a minimum of 16gb of ram. 1600 is referring to the frequency which for what you have is very low, 3000 freq or speed is optimal. allocated to them, and nothing else. so m.2 isn't recommended with only 10gb/s pcie? Best wait for Old Bear as he can better explain whats recommended, you definitely need more ram, at a higher speed tho. @ Gunter Severloh : our friend is using an Intel i5 4460 on a MoBo featuring a 1150 socket and on this one DDR3-1333/1600 is OK.
DDR4 RAM is not supported and there is probably probably no SSD M.2 NMVe slot on his MoBo. @ Ball Race : as I had expected one side of the problem is too high memory usage and too high HDD usage. You must remember that you are playing a highly demanding game with an entry level config. So you must set aside all unnecessary paraphernalia while playing, meaning that Edge, Firefox, Chrome, Tweeter, Facebook, YouTube and so on, must be closed before game launch. - restart your PC before playing. The best solution is to get a 250 GB SSD [minimum] in order to host both Windows and Arma3 Steam Library. On my test bench I am using a Samsung 860 EVO 250GB. On your rig a Samsung 860 EVO 250GB 2.5 Inch SATA III will be OKeven if a 500GB will be better ! There is a M.2 Slot but with some heavy limitations I think? Or? I have a motherboard from the same generation. Mine too has an M.2 slot but it is essentially useless as it's such an early revision, it supports almost nothing. In my quest for speed I ended up buying an Intel PCI-E SSD. Although the motherboard claims not to support NVME, using the supplied driver from Intel was good enough to get the drive going at full speed. From a theoretical point of view, yes, this Gigabyte GA-H97-D3H can accommodate a M.2 SATA SSD but I will suggest to be pragmatic and cautious. ATM, it's possible to make a deal by buying a Samsung 860 EVO 2.5" SSD 256/500 GB at a rather low price. wtf.. why do you have 2.3 gb available when arma 3 is running in MP ?!?!?!!? I posted 2-3 months ago asking for opinions on gaming laptops for Arma 3. In terms of handling Arma 3, what do you think? Arma 3 is my only concern for it as every other game I play is older or doesn't require many resources to run. i7-8750H operates @ 2.2 GHz base frequency and boosts all cores to 3.9 GHz (12 threads 9 MB cache). Sure it's slower than the desktop version and has 3 MB cache less, but it's the way it is for laptops. GTX1060 6 GB is also 100 MHz slower than the desktop version but with no other cuts than the frequency. With this setup you can play A3 @ ultra considering Full HD resolution of the monitor. 256 GB NVMe SSD will help you avoid severe FPS dips. @ -Snafu- : the TUF FX504GM is OK, rather good in fact! The only weak point is the "small" SSD, because you must have Windows and Steam Arma3 library on it. If you are playing with many Mods it will be quickly crowded. @ Groove_C : I am sorry to say that a SSD is not helping to get stable FPS level. A SSD is needed because it helps a lot to get rid of stuttering. Arma3 is streaming textures and a high speed disk is needed. Thanks for a huge amount of information on this thread. I've been playing since Op Flash, I'm just not savvy with computer technical jargon so please do excuse my lack of understanding. I'm in the process of buying a new laptop for my Arma 3 mission making. I usually like to play on Ultra settings with increased view distance and LARGE amounts of AI on the map. Usually I play these sandbox scenarios in single player then advance them into multiplayer with a few mates. I don't have the time or knowledge to include scripts in my missions to help reduce clutter. So I end up simply putting up with low FPS and a fully populated island full of modded units. I'm looking at upgrading my laptop to cater for my large sandbox style missions and also to prepare for Mechwarrior 5's arrival in September. I'd be very grateful if anyone would be willing to find the Arma 3 bottlenecks with the following specs. Thanks for your time very appreciated. Overall, the features of this laptop are good. In order to play Arma3 on a 1080p 144Hz screen, a GTX 1060 6 GB is enough. There is no need of a GPU over the GTX 1070 Max-Q whose performances are close. The only point on which I would bring a correction is the RAM. You will need to get the fastest RAM you can get. Thanks for the info. It appears the manufacturer can only supply 3000 MHz as the fastest speed for a laptop. Which would you recommend? The next lowest speed is 2666 MHz. I think I'll go for the NVIDIA 1070 simply for future proofing. Because A3 consumes almost 16 GB and this limit is software limit and can be lifted up with any upcoming patch and also I think you wouldn't like to be forced to upgrade once again when A4 comes out. Take a look on the RAM usage after several hours in multiplayer. Video memory usage is also almost 8 GB. And this is with internet browser and everything else closed, except Steam, Discord and MSI Afterburner. 3° The GTX 1070 Max-Q is not a regular GTX 1070 for laptops, it's slower, that why performances are close to a GTX 1060 6GB. @ Groove_C : ... " you wouldn't like to be forced to upgrade once again when A4 comes out." is not a good argument for many reasons, one being that because we do not even know if there will be an Arma IV. Like many others, I wish a "Next Arma" but we all know that BI is always very ambitious, the consequences in terms of hardware requirements are unpredictable. According to my own experience, I was forced to change my config with each new version of Arma. That's how it's been since the move from OFP to Arma. 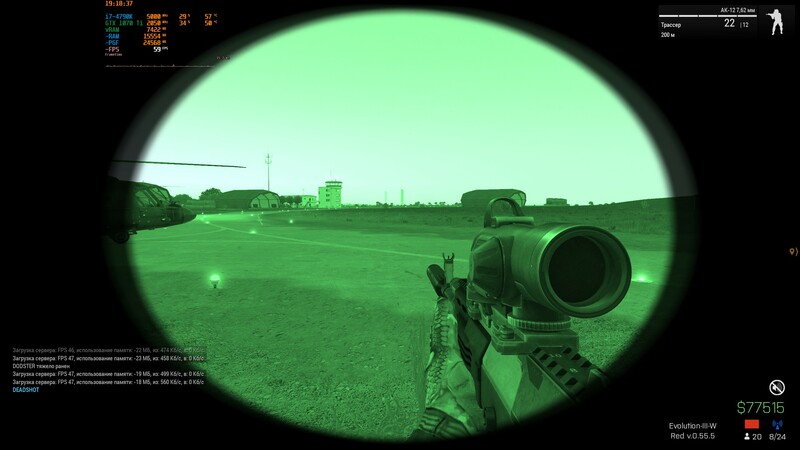 How is 2070 working with arma 3? Good enough for 1440p?